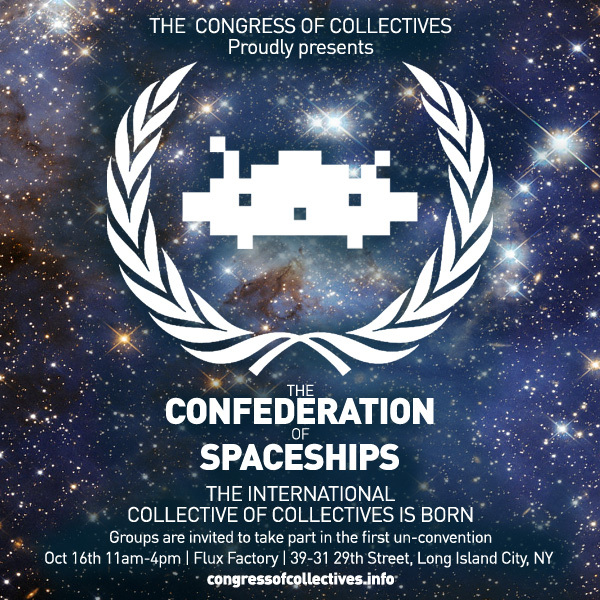 Below is a listing of events connected to Congress of Collectives, all are open to the public and most are free. Please note that event times and locations are subject to change. To learn more about the Congress of Collectives project click here. Meow Wolf is creating the Hall of Congress, with a ribbon-cutting ceremony on October 2. The UrbanLayers project team will set up a workspace at the Congress, where they will create an issue of UrbanLayers investigating the spatial nature of collective practice at Congress of Collectives. Prior to the Congress, UrbanLayers will work with local participants to put together a “visitors guide” that will include information such as recommendations for food, art venues, sights/sites, etc. Throughout the course of the Congress, participants will be invited to submit spatial information in the form of pre-planned tours, textual reflections and articles, and galleries of images to be added to the issue. Social Practices Art Network will present a listening station that will allow SPAN to capture stories about varied modalities of collective practice to produce an archive that explores collaborative practice. In Fill in Your Own Story – Start Here: Raketa will accumulate answers to their questions about utopia on their traveling rug around New York City, at Congress events, and at Wall Street. BROODWORK is the ongoing art and design project founded by Iris Anna Regn and Rebecca Niederlander to investigate the interweaving of creative practice and family life. Regn will discuss BROODWORK’s multi-faceted approach of talking, blogging, designing, event-making, and curating exists to examine and illuminate, and also to foster an advantageous environment that will in itself stimulate innovation. [EXPAND Crash Course description]This intensive workshop will focus on the collective process through the screening and discussion of collectively made film and video. Red Channels, Paper Tiger Television and Union Docs curated a selection of works that make the collective explicit—either visually, through showing the collective in action, or conceptually, through content and style. These videos will be the foundation for conversations, about the how, why, what, and what not of collective creation. Click here to go to the official page for this project. In this multimedia talk, Dara Greenwald will discuss and show clips from several creative collective actions. These documents and actions came out of collective practices of creation both behind and in front of the camera. Dara will present projects she has been involved in creating and documenting, as well as historic projects that she has been researching. These historic examples have been under-explored in the histories of activist and documentary media and will contribute important examples to the contemporary explorations of Congress of Collectives. Dara Greenwald is a media artist and researcher. She has participated in collaborative and collective cultural production for over a decade including the Pink Bloque, Ladyfest Midwest Chicago, Version Fest, Pilot TV, United Victorian Workers, Spectres of Liberty and other groupings that resist being named. She recently co-curated (with Josh MacPhee) a large-scale research project about the history of social movements entitled Signs of Change: Social Movement Cultures 1960s to Now as part of Exit Art’s Curatorial Incubator. Her own experimental videos have screened widely on the festival and media arts circuit (including at Liverpool Biennial, Cinematexas, Yerba Buena Center for the Arts, Eyebeam, New York Underground Film Festival, etc). [EXPAND Collective Lock-in description]An all day into the night program of open panel discussions, a workshop, and snacks that will reach critical mass at midnight to become the UBERCOLLECTIVE. The unveiling of our “Hall of Congress,” an immersive installation created by Santa Fe-based art collective Meow Wolf. A discussion about the many relationships to audience, including conventional passive consumption, collectives who demand engagement or production from their audience, and collectives who exploit or are exploited by their audiences. This discussion will result in strategies for developing a “3rd space” for engaging participants. Speakers: Laurids Sonne (Parfyme), Niki Russell & Dan Williamson (Reactor), Christopher Robbins (Ghana Think Tank). A two-part panel discussion addressing the enormous variety of collaborative structures, the success and failures of group think and decision-making, and the successes and failures of consensus decision-making. Speakers, part 1: Meow Wolf, Jean Barberis & Christina Vassallo (Flux Factory); part 2: Kerry Downey (Action Club), AAS. Throughout the evening – SP Weather Station will transmit weather reports into the UBERCOLLECTIVE lock-in from weather stations located in the participating artists’ hometowns, in order to keep a connection to the outside world. Flux Factory artist-in-residence Jesper Aabille, CEO of Aabille Group, will cook breakfast for visitors and participants during his Fried Eggs on Lumber action. The project is sponsored by the Danish Arts Council Committee for Visual Arts. 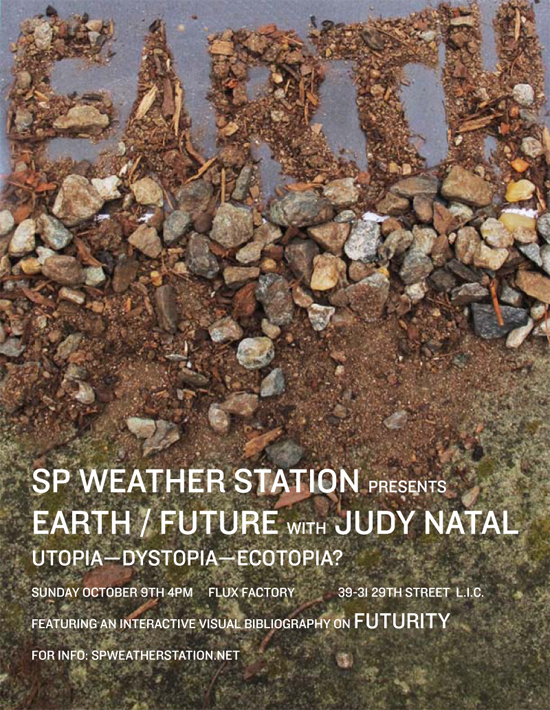 SP Weather Station presents EARTH / FUTURE: Utopia—Dystopia—Ecotopia? Why do artists imagine the future? Will we see Utopia? Dystopia? Ecotopia? The third in a series of events related to Air, Water, Earth and Fire, SP Weather Station presents EARTH / FUTURE, featuring a presentation by artist Judy Natal. As a photographer and the first artist-in-residence at Biosphere 2 (and co-creator of its ongoing residency program), Natal has often been an observer of contained environments—artificial ecosystems and protected and designed wildernesses—in an uncertain relationship to alien terrain. She travels to extreme environments to capture images that suggest life “after nature,” or perhaps a new relationship between the Earth, the built environment, and our human-ness. Her interest in the way landscapes are altered—by scientists, engineers, designers, and utopians—has recently opened a broader inquiry into the myriad sources of our collectively constructed futuristic visions. Mining fields such as science fiction, ecology, robotics, architecture, and art history for source material, Natal posits a relationship between a fantastical/imagined future and the peculiar ways the land is already technologized for research, tourism, and survival. [EXPAND Actions description]Reactor, AAS and Gaengeviertelwill perform spontaneous actions in public spaces throughout the city, in collaboration with members of the public and other collectives. 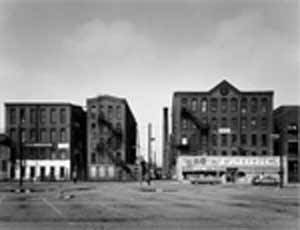 On Monday October 10 at noon, AAS will conduct a dérive from The New School of Social Research (6 E 16th Street, Manhattan, NY, 10003), where they will record the journey as participants drift, and in the evening AAS will divine a message from the documentation, setting up a séance in the gallery space at Flux Factory. [EXPAND Greatest Love of All description]Greatest Love of All by Angela Beallor, Kerry Downey, and Niknaz Tavakolian harnesses the inspirational pop song as a meditative prompt for impromptu queer collectivity. The song was originally written by Michael Masser and Linda Creed for the film The Greatest, made famous by soul icon, George Benson, but most notably performed by pop star Whitney Houston. It has a complicated history, an ironic present, and, as with anything, an uncertain future. The lyrics lay out hope to and for the future barring shadows, and embracing self love. Parallels emerge within queer experience, both tragic and inspirational. This project uses the song as a site, i.e. as a space where an event/activity is occurring (or has occurred). In this regard, it occupies several types of time simultaneously. We are using these spaces to address issues around American identity, community, and collectivity and how histories are uplifted, distorted, hidden or erased. This performative event is a site-specific engagement with the song’s layered histories, using the liminal space of a hotel suite to engage with the contradictions between the song’s harmonies and its cultural discords. [EXPAND Unconvention description]The Confederation seeks to form a collaborative, international organization that acts as a cultural catalyst, focusing on projects that encourage and enable social and cultural change and exchange on both global and local scales. SHARING IS CARING, WE CARE. The conversation begins at 2 pm, please join us from the start. To confirm participation, contact keremjh[at]gmail[dot]com. [EXPAND Collaborative Means description]Collaborative Means brings together a series of artists working both collaboratively and collectively, and who rely on cooperative strategies for the realization of ambitious projects. The included artists have practices that exist on the streets of densely populated cities, on Twitter, on boats, at factory parties, in video works and films, and in a variety of academic, DIY, and artistic institutions. Viewers can expect to be a part of a reality show sermon, see collectively-produced video works and performance documentation from Flux Factory, learn about a combine that makes mechanical mischief machines, and much more. Despite the diversity of the projects and practices presented, they share a common thread: they could not exist without exchanges between individuals. A celebration of those who have abandoned or expanded traditional alone-in-the-studio artist practices, Collaborative Means presents talks, screenings, and live performances by collectives, artists, and cultural producers steeped in participatory practices and collaborations. Including Man Bartlett, Genevieve Belleveau aka gorgeousTaps, Flux Factory, Jaime Iglehart, Madagascar Institute, Oleg Mavromati and Boryana Rossa, Jeff Stark, and Angela Washko.